With an extensive set of hardware and software features working in perfect unison, Sitecom’s new flagship router delivers an unsurpassed wireless experience and more speed for all devices. Rotterdam (The Netherlands), December 2015 – Sitecom, one of the leading European brands for home networking and connectivity solutions, launches its new flagship router. With Wi-Fi speeds of up to 1734 Mbps on 5 GHz and up to 800 Mbps on 2.4 GHz, a 1.4 GHz Dual-Core Qualcomm® Internet Processor, Qualcomm®StreamBoost™ and Qualcomm® MU| EFX, Greyhound delivers not only incredible Wi-Fi speeds for newest AC-devices but also a real improvement for older wireless-N devices. Its four external dual-band antennas can be adjusted to deliver an optimized Wi-Fi range throughout very large homes. In combination with Beamforming, Greyhound maximizes range, eliminates dead zones and creates more reliable Wi-Fi connections for all devices. With five Gigabit Ethernet ports, two USB 3.0 ports, an SD-card slot and analog and digital audio connectors, Greyhound also delivers ultimate connectivity for all devices at home. Software features such as AirPlay & DLNA, AirPrint, print server and Time Machine support complement the hardware and turn Greyhound into an extremely versatile Wi-Fi router that delivers smooth Ultra HD video streaming, lag-free online gaming and handles demanding tasks like no other. With a powerful 1.4 GHz Dual-Core Qualcomm® Internet Processor and 512 MB DDR3 RAM, 128 MB NAND Flash and 16 MB SPI Flash, Greyhound is up to 8x more powerful and has 8x more memory than the average router. Whether users stream Ultra HD movies or do intense online gaming, Greyhound runs all processes smoothly, even when a multitude of devices and applications demands its processing power and memory. Unlike routers with traditional Quality of Service (QoS), which treats all applications equally, Greyhound’s StreamBoost feature responds to applications individually and provides each with the bandwidth it needs, giving time-sensitive ones, such as online gaming, a higher priority than others. With Multi-User MIMO, Greyhound can multitask to deliver up to 3x faster Wi-Fi. Instead of serving one device at a time, Greyhound uses the airwaves more efficiently to serve multiple devices at once, getting the maximum effect of 11ac and faster Wi-Fi for all. Greyhound’s four adjustable dual-band antennas are 2x stronger than the average router’s antennas in terms of gain (5 dBi) and 4x stronger in terms of power output (400/800mW), delivering an optimized Wi-Fi range throughout very large homes. With Beamforming, Greyhound delivers dramatic range improvements by localizing devices in the network and pointing the Wi-Fi signal directly at them instead of sending it out in a general direction. As a dual-band router, Greyhound supports two Wi-Fi bands, the 2.4 GHz and the 5 GHz band. The band steering feature detects, if connected devices are also dual-band capable and then automatically connects them to the ideal frequency band, making sure home users always have the best connection without having to think about it. Greyhound has a Gigabit WAN port and four Gigabit LAN ports to connect 4K Ultra HD TVs, game consoles and other wired devices. It also comes with two USB 3.0 ports that can be used to connect any printer and print wirelessly from Windows or MacOS devices. iPad or iPhone user can print directly via AirPrint without installing any software. Moreover, users can connect hard drives and stream content directly to AirPlay- and DLNA-compatible devices in the network. With SuperSpeed USB 3.0 and the powerful 1.4 GHz processor, transfer rates are up to 10x faster than USB 2.0, ideal for flawless Ultra HD video streaming or printing large multimedia files. The SD-card slot comes in handy to stream photos directly from an SD-card to the big screen of a TV. Greyhound’s 3.5mm audio jack and the S/PDIF connector allow home users to connect speakers and turn them into Wi-Fi speakers. Greyhound supports both AirPlay and DLNA and thus makes wireless music streaming possible from practically any device. Thanks to the high-end DAC, users can enjoy their music in premium quality, wirelessly. Users can easily setup SMB & FTP servers to share, store and access files within the network or from anywhere in the world. With the download client, they can download torrent files directly to connected devices in the network. Moreover, Greyhound integrates with Apple’s Time Machine feature to backup Macs to connected hard drives. Greyhound features an OpenWrt firmware with a customized skin for the web-based user-interface. With 128 MB + 16 MB Flash memory, Greyhound has up to 8x more than the average router and plenty of room to install new OpenWrt packages to add additional features that were developed by the community. Users without OpenWrt experience can use the basic mode of the user-interface or use the free MyWiFi app, giving access to the most popular router settings directly from the phone. 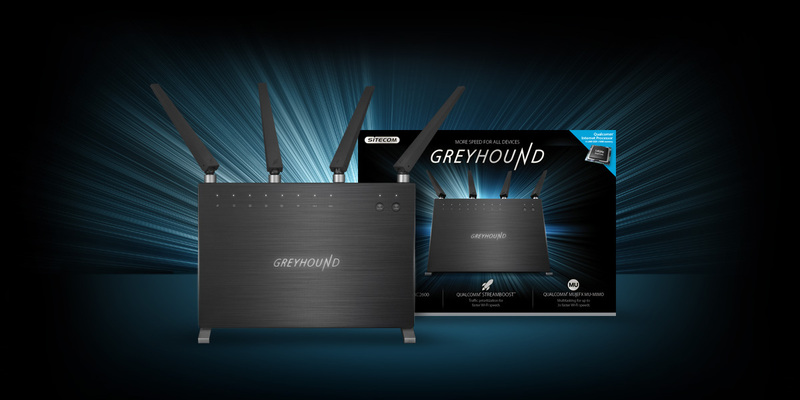 The Greyhound AC2600 Wi-Fi Router is available in select retail stores next week.